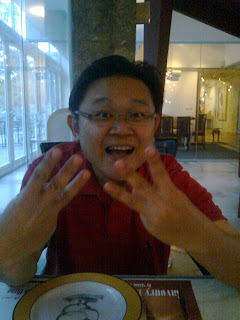 Haha...yes, I will be 33 in a few hours time. 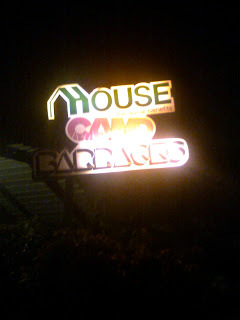 I just came back from Dempsey Hill "House Camp Barracks"! 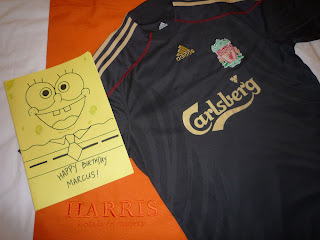 I got a really CRACKING card and a Davidoff Cool Water from Cindy! YEAH! It's been awhile since I last used Cool Water. 7pm today-we reached the entrance, we were greeted by a polite gentleman. 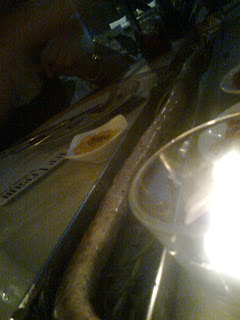 I asked him if this is the 1metre long sausage place, he said yes and we were ushered to a cosy table. Finally tasted the 1metre long sausage and it was really good! We chose the pork one. LOOK! The porky sausage stretches from one end to another end of the table! 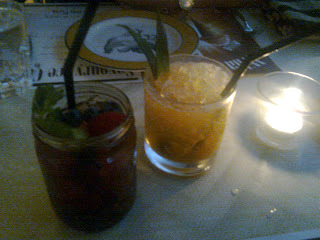 The alcoholic drinks are also highly recommended here and I got myself a Latin Fling, a combi of pineapple, lemon and rum (i think!)... the alcohol content was really high man! I was all red after downing it! But it was really good signature cocktail of this cafe. 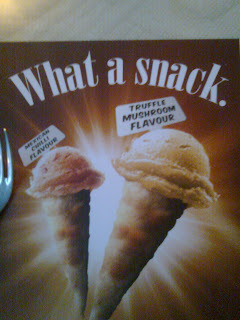 Yes, you didn't read it wrongly, the ice-cream is indeed "Truffle Mushroom" flavour! I tried it and I love it! 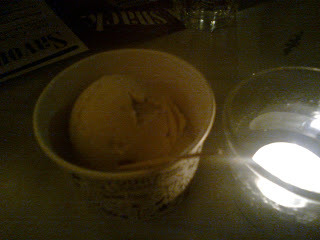 Raw mushroom taste, not exactly all savoury, but a tinge of sweetness combined to deliver a pleasant taste. Overall verdict of this place? 4.5 out of 5! 0.5 was deducted for the air-con! Not cold enough! 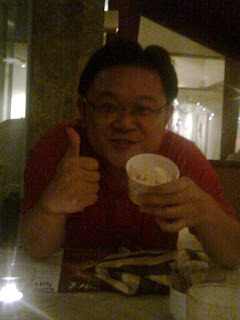 The service was excellent and the food was good quality, will definitely return! 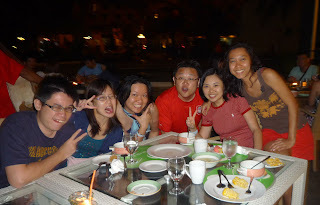 Thanks to all The Gangsters aka Animal Farm who celebrated my birthday with me in Batam. You guys ROX! 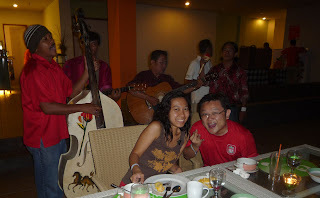 It was really a nice surprise to have the band sang the birthday songs for me and Wati (hers on 23 Aug!) Really a memorable moment then! Thank you all for making every moment of my life so special and so memorable! As you might already know, Las Vegas is also known as the Sin City. You would expect to find all the most devilish vices there right? But I just found out from wikipedia, that contrary to what many people believe, prostitution is actually illegal in Las Vegas! 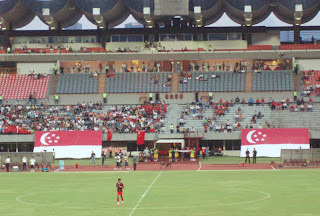 I went to the National Day Challenge between Singapore and China hoping to see our Lions bounce back from that painful defeat to Liverpool and yes, also hoping to win a pair of tickets to watch Liverpool meet Manure at Anfield on 24 Oct! I went there alone, I sms 4 friends, and only 2 responded and both couldn't make it and 1 even told me he is not a Lions fan anymore since the 80s! Huh?! 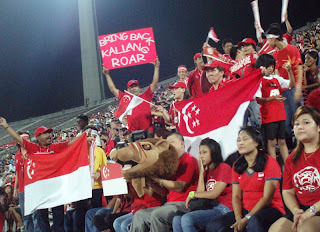 I thought all Singaporean is a Lions fan! But then again, I am quite used to this kind of scenario. Nobody give local football a chance. That's very sad. So to add on to my National Day wish- May all Singaporeans come out of their shell and be there for our National team whenever they need us! Back to the match... Alam Shah gave us a 7minute lead. A good header, connecting well with the corner. After that, it was China who dominated (yes, expected) and they got their equaliser some 30mins later. We defended well really and Hariss Harun was my man of the match. He was really composed and made tackles so well that he finished the whole game. In the second half, China had at least 5 good chances but Hassan Sunny was super for us. Duric missed a sitter, one on one with the China keeper, yet he ballooned the ball high into the night sky. 90mins was up and the game went into penalty shootout. In the end, Duric, also the Birthday Boy today, missed the crucial last penalty the gave China the meaningless Friendly cup. 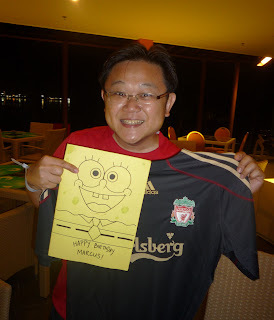 So did I win the ticket to Anfield? Of course, No... the winning ticket number was 10631, mine? 10653! So close isn't it?! Haha... So in the end, all I got was a sore throat (All the Singapore Singapore Go Go, S-I-N-G-A-P-O-R-E, and most of the time..."Defend, Defend...") that threatened to ruin my voice box and a picture of John Dykes car! 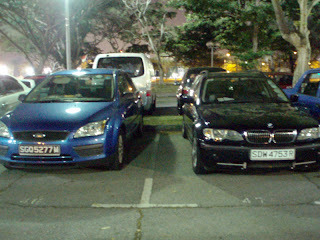 His BMW and my lovely Focus. 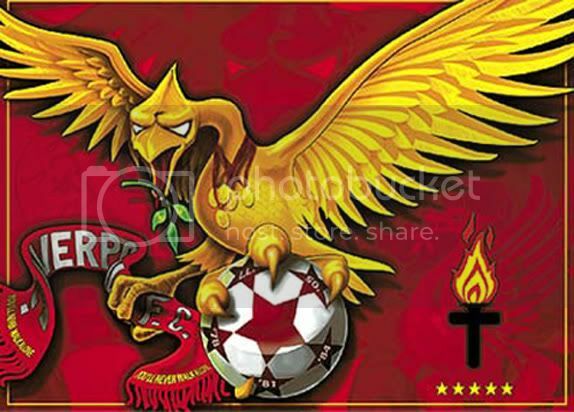 Maybe I will strike 4D with his car plate number and can go Anfield afterall!!! Wish me luck huh! Yes! 44th year into our independence and standing strong globally! 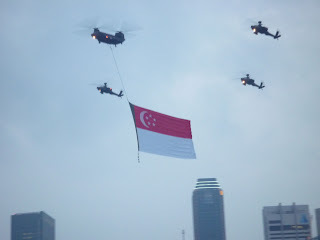 This year NDP moved me to tears when I saw PM Lee shedding tears while we were singing a remix of "We are Singapore, Count on me Singapore and Stand up for Singapore". When it was time for the pledge taking, I, Cindy and my wife also stood up and said the pledge in our living room! What a first time! We were even trying to hear if we can hear the pledge in our neighbourhood. I gave out a loud cheer out of my balcony after the pledge taking. 1. The youth will grow up to be caring and compassionate adults. 2. May motorists drive with care and show their driving etiquette. 3. Graciousness be shown by everyone. 4. Weather to become cooler. 5. Our econony will recover and there will be big bonus come the end of the year! I wanted to get a good black forest cake for my best pal and after I typed "Best Black Forest Cake in Singapore" in Yahoo search, i found this Cafe in hungrygowhere. 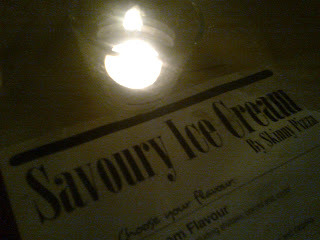 Bascially, I couldn't find any other place that has good recommendation on black forest cake. After looking at the pics of their cakes in hungrygowhere, I finally settled for Purple Rose. I called them and was answered by a polite gentlemen, who passed the phone to a lady. The lady was very precised and polite when answering my queries. These have surely made a good first impression on me! First huddle passed for me as service counts everything for me, food quality second! So I made a order for a half kilogram Black Forest cake. 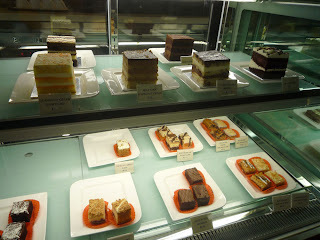 After I enter the shop, my eyes were glued to the cakes in the glass display shelves! All of them seemed to be calling out to my stomach! The ambience in the shop oozes the mood you get in hotel coffee houses! No exaggeration about that, you gotta see it for yourself! 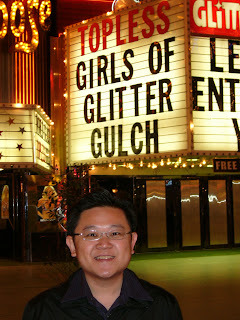 Apparently, this place also got featured on The Straits Times and I-Weekly. The lady boss told me people even travelled all the way from Pasir Ris just to get the cake. Oh by the way, this cafe is located at Holland Drive. 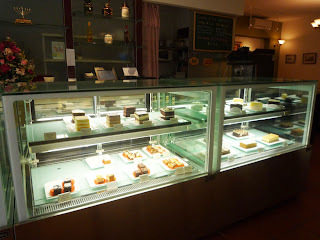 I finally got my cake and was told I could get their brownie for $3 (U.P $12) for every purchase. " Why not?! ", I told the lady boss. I left the place and eventually returned just to take some good photos of the shop. My verdict on the cake : I love it! And half a kilogram to share with 5 other friends was simply not enough for me! 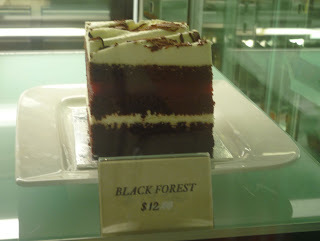 I have not tried the authentic German Black Forest cake before, but now I know how it taste like! Thanks to Purple Rose! 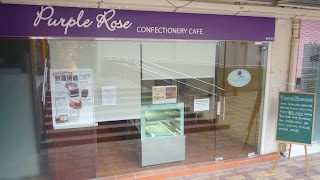 Where is Purple Rose Confectionery Cafe?